Beavers are the largest, yet least seen, rodents found in Oakland County. Even though these creatures can weigh more than 50 pounds with their massive flat tails, it’s difficult to spot them because they are mostly nocturnal and semi-aquatic. They are without a doubt, the best dam builders in our county. 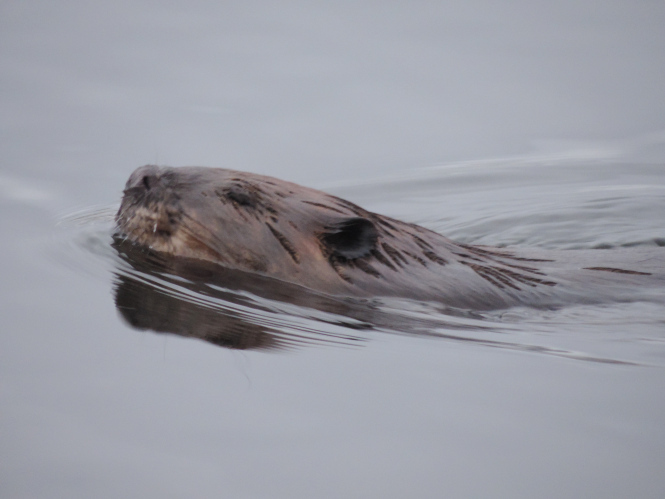 During late autumn, beavers busy themselves preparing for winter by strengthening their dams, adding extra mud and sticks to their fortified lodges and most importantly, stocking their underwater pantries. Wildlife biologists like to call those winter food caches Beaver Freezers. Rarely does a human get to see these underwater food storage sites; for usually as the ice begins to freeze, it quickly turns opaque and snow blocks any view. Not this year. On the second day of January, I had the unusual opportunity to inch my way carefully out over crystal clear ice and capture images of the top of a beaver freezer in one of the 13 Oakland County Parks. 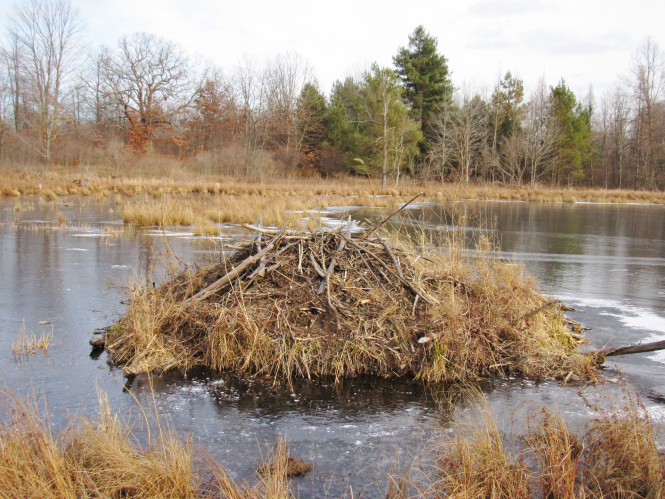 Every autumn, beavers that live in cold areas (and that includes the entire State of Michigan) construct multiple food caches in relatively deep water close to their lodges or just a short swim away under the ice. Each cache is an accumulation of tree branches and is meant to sustain the beavers during winter. In the waning days of autumn, the industrious beavers felled and gnawed tree limbs and saplings into short manageable lengths and dragged them to the lakeshore. In doing so, they moved along canals they created to keep their exposure to predators at a minimum. Once back in the lake, the beavers jabbed one end of a limb into the muddy bottom to hold it in place. After few days of work, these winter caches look like minute underwater forests. 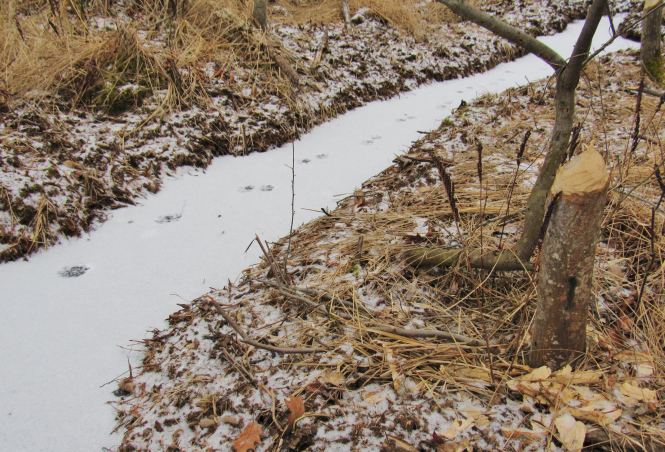 Coyote tracks on top of a canal dug by beavers. A rare capture of a swimming beaver taken last summer in Ontario. When a beaver gets hungry, it is just a matter of slipping down into one of the lodge openings beneath the ice and swimming to their underwater cold storage: the beaver freezer. 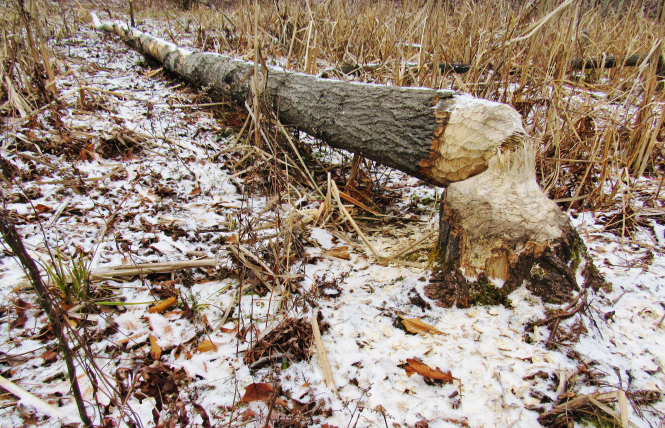 The beavers drag the day’s meal into the feeding chamber of their lodge and strip off and eat the bark and inner cambium layers where the nutrients are found, and then discard the rest. This method is not too far removed from humans eating corn on the cob. 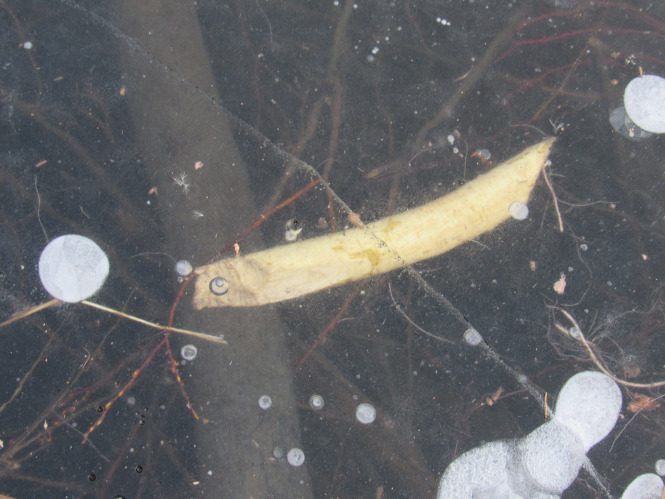 This winter, the remains of some early woody meals floated up to the bottom of the clear ice and can be clearly seen next to trapped air bubbles exposing a secret of the beaver freezer. When spring approaches, or if ice melts early, the adult beavers emerge from their dark aquatic world to feed on fresh woody stems and emergent vegetation along the shore. During these forays, they are vulnerable to wolves and cougars in the north country of Michigan’s Upper Peninsula. In the Lower Peninsula, they draw the attention of coyotes on the wilder side of Oakland County. 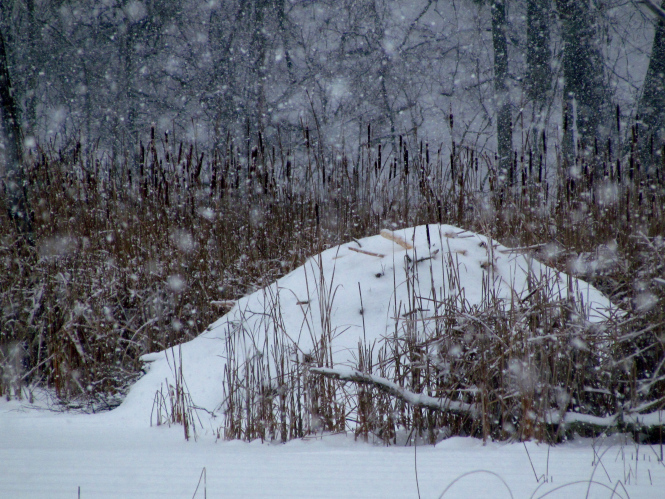 But now, as winter settles in, the beavers of Independence Oaks, Highland Oaks and Rose Oaks county parks are safe and secure in their snow-capped lodges. In the spring of 2015 colorful new interpretive signage was placed along trails in those three parks will share more secrets of the “Best Dam Builders in The County”. 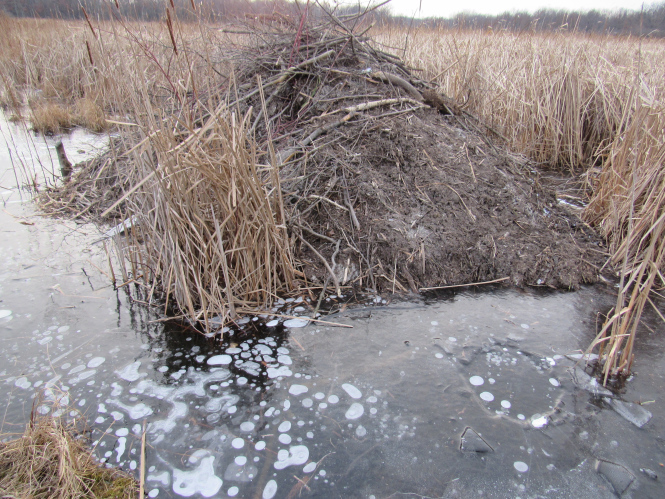 All beaver lodge images in this blog were captured in the Oakland County Parks. Visit www/oakgov.com/parks for details and maps on all 13 Oakland Parks and winter outdoor recreation opportunities. Originally published on January 9, 2015.